08/25/17 – For our final summer TPC Gathering, we started with science updates. Joe shared a paper recently published in Science investigating the human microbiome from modern hunter-gatherers in the Hadza population of Tanzania with a goal of identifying a representative ancestral human microbiome. Two interesting distinctions between the gut microbiota of hunter-gatherers vs. people living in industrial areas were 1) a significant increase in microbial diversity and 2) a seasonal fluctuation in microbiome composition. Although the functionality of these members is not known, they are thought to be correlated with the appearance of chronic diseases (such as asthma) in humans in the past one thousand years. To read more about this paper, click here. After science updates, we considered the questions, “What contributes to success in science?” and “How can we develop skills required for being successful?” as a group. Our discussion was oriented around a BenchFly blog post inspired by studying the habits of highly effective people. First habit of a successful scientist: taking responsibility of your bench. It was obvious to everyone that scientists should own their projects and get involved in the various steps of doing science, including generating interesting and testable hypotheses and designing experiments to test them. What some of us had not considered was the role of a principle investigator in promoting and training their lab members to learn this important responsibility. Along these lines, we discussed that, to be a successful principal investigator, it is necessary to set up the lab environment in a way that best facilitates training of successful scientists who obtain the proper skills for taking responsibility of their bench. Second and third habits of a successful scientist: setting a measurable goal from the start and prioritizing the goals. Often, the goals we set during our scientific career are too broad. Getting more specific helps bring proper focus to our efforts and increases our chances of obtaining our goals. One way we thought we could achieve specificity is by defining a series of sub-goals. However, we can also fall into the trap of busying ourselves with working towards easy, but perhaps less important goals, rather than the ones that are more important, but perhaps more difficult. To avoid this, we all agreed that, in addition to defining specific sub-goals, it is necessary to prioritize our goals based on level of importance and approaching deadlines. Fourth habit of a successful scientist: designing a “win/win” experiment. While this idea was very appealing to everyone, it provoked some criticism. Some challenging questions dealing with complex phenomena are very risky in nature as they may yield “negative results”; however, the fear of “negative results” should not discourage a scientist from pursuit of solving the problem. Instead, this should challenge us to think differently and take a new look at the problem from a different angle. Although this type of approach is highly risky, it can also be highly rewarding. Developing the skills needed to design research programs and generate questions based on a win/win outcome requires a set of thinking skills that are expected to sharpen as scientists advance in their career paths. What are we or can we be doing to develop these skills? Fifth habit of a successful scientist: first listening, then speaking. It is crucial for scientists to communicate their thoughts and findings to their colleagues and respect their feedback even if they disagree with it. It is also important to think about other scientists’ perspectives since they might have an important point that we could easily overlook. Effective listening is a requirement for productive communication and relationship-building between scientists. 08/18/17 – Last Friday we discussed the recent article in Science Careers entitled “Another tenure-track scientist bites the dust” (click here to read). Our conversation focused on the often “not discussed” issue faced by new faculty – learning how to successfully fund their research. 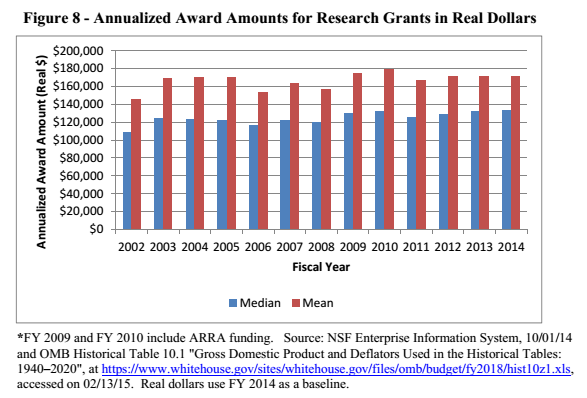 Part of our discussion revolved around one of the frequent complaints voiced in academia: lack of funding. “If only there was more money, then all our problems would be solved.” While we all tend to agree that getting funded has become more difficult, the reason for this difficulty is generally assumed to be funding cuts. Is this true? 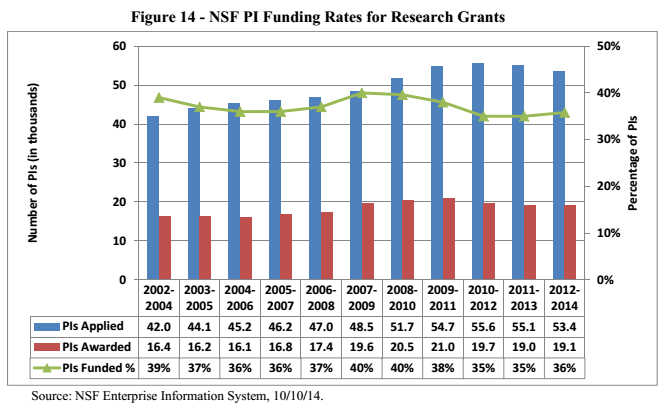 If we look at data available from NSF, the amount of money allocated to research has stayed fairly constant, while the number of applicants has increased. This would support our perception of “funding is harder to obtain” because, while the size of the pie hasn’t changed, the number of us attempting to get a slice has grown! The quick answer many might have is, “Increase the funding!” However, we also considered that adding more money may only serve to escalate the problem, as this tends to result in increased hiring, and thus creates more mouths to feed, so to speak. Of course, none of us are against more jobs and more funding, but we also need to be realistic and consider what is sustainable. At what point do you draw the line? What about money for new PIs? Another part of our discussion centered around the main criteria for obtaining funding, one of which is the perception of “how good” a scientist is. This can be a huge hurdle for early career scientists who have not had time to build a proven track record. 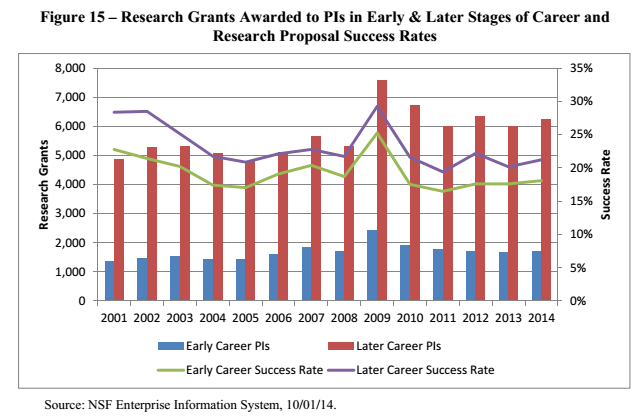 Data from NSF show that early career researchers have a lower funding success rate relative to late career researchers, and that it takes an average of 2.4 proposals before a new professor will successfully obtain an NSF grant. While it is easy to blame the system, and the system has flaws to be sure, this ultimately does nothing to improve our situation. Instead, we should focus on what steps we might take, and what skills we can develop prior to becoming faculty (if that is where our career paths lead) to improve our ability to get funded. As for the system being flawed, it is in fact our system! If we see problems, what are we doing to address them? Are we simply complaining, or are we actively looking to identify and implement solutions? As good research scientists, the best approach is to first find the facts – collect the data – to be sure we have correctly identified the problems before attempting to find solutions. We then need to work together, get creative, be willing to “think outside of the box” to find real solutions. Finally, after identifying the problems and potential solutions, we need to use a scholarly approach in implementing change. How will we assess whether the changes we make improve, have no effect or make the situation worse? While we may not want to bother with this part of doing science, it is a critical element to ensuring our system works effectively. We each have the option of either sitting back and going along with the status quo, or taking ownership of our system and doing what we can to improve it. If you choose the former, you have no right to complain. If the latter, be sure to use the same approach as you use in your work – scholarly research. Hope to see you next time we meet on the edge of science! Special thanks to the ASM Grant Writing Course for sharing many of these tips and the link to the NSF data. 08/11/17 – Sheng Yang started what has become a tradition at TPC to begin each Gathering with science updates. Due to the various skill development workshops and practice talks we have had over the summer, we have not taken the time to do this, so last Friday, we took a whole hour to catch up! To complement the interesting conversation, we enjoyed some delicious, homemade chicken salad shells. Sean Johnson (Hamburger lab) started us off with an overview of a paper he just resubmitted for publication. Bethany Huot (He lab) then shared several resources, including the PlantingScience mentorship program and Plantae’s new podcast series, The Taproot, by Ivan Baxter and Liz Haswell. We also had a brief discussion on the topic of reproducibility and integrity in science, which was the topic of an editorial in the August issue of Science Magazine. Danve Castroverde (He lab) shared a paper entitled “Functional annotation of chemical libraries across diverse biological processes,” which was recently published by friends of his in Nature Chemical Biology. Finally, Brian St. Aubin (Howe lab) shared his experience interning at a small biotech company in Columbus, Ohio, which he did as part of the Plant Biotechnology for Health & Sustainability trainee program. While we are all familiar to some extent with the research end of doing science, most of us have not been exposed to the steps it takes to take a bring a new technology to market, including scaling up production to meet demand. 08/04/17 – Last Friday, Alyssa Preiser followed Brad’s lead and took advantage of The Community of Minds of TPC to get feedback on the proposal she is preparing for her upcoming preliminary exam. Alyssa is a graduate student in Tom Sharkey’s lab, and is investigating carbon flux in the Calvin-Benson cycle. While most of us do not work in this area of plant research, it was a great opportunity for us to apply the critical thinking skills we have developed to research questions outside our usual scope. In addition to getting feedback on her aims and approaches, Alyssa also got a tip from André about a special kind of SDS-PAGE system, Phos-tag™, that enables detection of phosphorylated proteins. Alyssa was so excited, she wanted to get right back to the lab to try it out! Once again, The COM was hard at work…if you call sitting around eating chicken wings and discussing our science hard work! 07/28/17 – Following science updates, Brad Paasch took advantage of The Community of Minds of TPC to get feedback on the proposal he is writing for his upcoming preliminary exam. After giving a brief background on the project, which involves investigation of the plant microbiome, he shared his three aims and the experiments he has designed to address each aim. One of the biggest challenges in writing a proposal is clearly defining the aims, which should be specific and capture the relevance and novelty of the work. As Brad’s aims were a bit broad, Bethany suggested first framing each aim as a question: What am I trying to accomplish with this part of the proposal and why? Once the question to be addressed is clear, it becomes easier to reframe the aim from “Characterizing …” to something more specific and more interesting. Kyaw chimed in with a recommendation to clearly highlight the hypotheses for each aim. Show your reviewer that you have an idea of the expected outcomes, and the information each potential result will provide. On that note, we discussed the importance of knowing Why each experiment is worth pursuing. It is easy to fall into the trap of simply measuring things because we can and forgetting to think about what that information means. What is the Big Question? What are my hypotheses? How can I best design each experiment to test those hypotheses? What are the limitations of each experiment and/or assay? What challenges, either technical or biological, can I expect to run up against? Anyone with minimal training can go into the lab and generate data. When going for your qualifying exam, your committee is looking for evidence that you are capable of successfully navigating the philosophical AND technical aspects of doing science. After all, the degree we are pursuing is a Doctor of Philosophy! 07/21/17 – Last Friday at The Pub Club we worked to “Fill the Void” by critically evaluating research the Day lab will soon be submitting for publication. Yi-Ju Lu, who will be first author on the manuscript, presented the main claims of the work as well as the evidence they have gathered so far supporting those claims. A diverse group of scientists, spanning the spectrum from undergraduate to distinguished professor and including researchers both within and outside of the plant-pathogen field, listened and provided constructive feedback. Our discussion included the current and potential impact of the work, and how the story could be better framed to highlight the key findings. Being an expert in the field, Sheng Yang He gave great advice specific to the Day lab’s research, while Tom Sharkey, a plant biologist specializing in carbon flux during photosynthesis, spoke to the importance of carefully choosing language that will be easily received by those outside your field. Tom also emphasized the importance of storytelling in science, saying that data are meant to be used to tell a story rather than simply be published as a jumble of random observations. We finished the Gathering with a discussion of how to determine the level of impact your research has within and beyond your field. Unfortunately, name recognition and perception of impact do play a large role in getting published in the “top” scientific journals. However, the skill of artistically telling a story that best frames and highlights the impact of the work is often the difference between “accepted for publication” and “rejected.” As outlined in a new post on The Hub, “Science is Communication – A Time to R.O.A.R.,” this is a skill each of us can develop! In taking time to meet on the edge of the science being conducted in our own labs and discussing in detail the merits and current weaknesses in our work, both the “recipient” and the “givers” of the feedback have something to gain. Those whose work is evaluated gain input to help improve the quality of what is submitted for publication, while those providing the feedback – or listening to the questions and comments provided by others – develop our ability to better communicate and support our own research findings. This is exactly how a scientific Community of Minds is supposed to work! Hope to see you next time! 07/14/17 – Last Friday, Miranda Haus worked to develop her science communication skills by practicing one of the talks she will be presenting at the upcoming International Botanical Congress (IBC) in Shenzhen, China. This provided TPC members an opportunity to develop our skills as well, as we listened and provided critical evaluation of Miranda’s talk. After Elevator Pitches, we began by first listing out the attributes that make a good presentation (storytelling, clear objectives & conclusions, etc), and also what we would want in a critical evaluation of our own communication. Miranda requested that we be specific with our comments, and also that we let her know both the negatives and positives. To help us cover all the bases, Miranda provided an evaluation form (click here), which is a resource provided by the University of Tennessee Knoxville. Miranda’s first talk focused on the novel application of optical topometry to the plant epidermis (published here if you would like to read). This was more of a method talk, but Miranda had many examples of how she has used the method in her own research. Once she was done presenting, we each took a few minutes to fill out the form, and then went through each section – Content, Visuals & Delivery – as a group to provide our critical evaluation. Being the inquisitive scientists that we are, we also had many questions for Miranda regarding the various applications of the method. Due to the level of interest, by the time we were finished we ran out of time to hear Miranda’s second talk on key developmental changes in stomatal patterning when Arabidopsis is grown in elevated atmospheric carbon dioxide concentrations. We will have her share that sometime later in the summer, as everyone seemed very interested in her work! Next week we will have another opportunity to work as a Community of Minds to develop our scientific skills, as Yi-Ju Lu (Day lab) shares her research with us and looks for our peer review prior to submitting her work for publication. This is exactly how a Community functions – each member receives as each member contributes. We hope to see you there! 07/07/17 – After our opening round of Elevator Pitches, TPC members discussed more Conference Highlights. We began with He lab members – YanJuan, Kyaw, Xiufang & Bethany – who participated in ICAR (International Conference on Arabidopsis Research), followed by Alyssa Preiser, who attended, presented & practiced her Tweeting skills at the ASPB meeting in Hawaii (check out the Sharkey Lab Twitter feed here). One of our favorite talks from ICAR was from Keiko Torii, who began by advising students and post docs to actively network, as these relationships will be essential throughout your career. She then explained how her interdisciplinary team-based approach led to the development of a synthetic auxin receptor-ligand pair that enabled them to study precise tissue specificity in planta. (For more on Keiko’s talk see end of #ICAR2017 Day 4 – Rocking and Rolling! Storify.) What made Keiko’s talk stand out was the combination of impressive, cutting edge research and her genuine enthusiasm for her work, which came across in her engaging presentation style. Other favorite talks included Chris Pires’ talk on Brassicaea, the “dogs of the plant world” (Day 3), José Dinneny’s talk on cell recovery after salt stress (Day 4), and Minako Ueda’s talk showing the use of two-photon excitation microscopy to track cytoskeleton dynamics in the zygote (Day 5). Alyssa shared that her favorite talks from ASPB were those that demonstrated a real-world application of scientific discovery, and also the session on entrepreneurship in science. Our conversation led to the “up and coming” people in science, examples of great scientific mentorship (see Sue Rhee‘s training statement here), and finished with a discussion of the amazing facilities, approach and science done at the Danforth Center (see research page here). All in all, it was another great hour of scientific discussion and skill development. Hope to see you next week! 06/30/17 – Since skill development requires committed effort and feedback over time, last week we kicked off our Gathering by practicing our Elevator Pitches. Levi improved his hook by opening his intro with the fact that his interest in plant science stems from his upbringing on a farm. Miranda shared her desire to integrate her dual passions for scientific research and education, and Reza told us how his interest in small molecules led him to investigate the role they play in plant-microbe interactions. After our E-Pitches, Miranda showed pictures and told stories from her recent trip to the Ukraine, and Kyaw shared some of the highlights from the recent ICAR (International Conference on Arabidopsis Research) meeting. Bethany then showed the group how we can use Storify to share scientific information in a more Story-like format. For more information on this, click here. 06/23/17 – Last week a large number of us were in St. Louis for the Arabidopsis meeting (ICAR). Tweets of the meeting highlights have been compiled using Storify, and you can find them on the right hand side of The Hub. In addition to some great science, we had some excellent workshops on Careers & Communication as well as New Technology & Resources. While it is great to go to scientific meetings and interact with members of our greater COM, those of us who Actively Participate in The Pub Club each week have the Distinct Advantage of experiencing this Conference Effect each and every week! Not only is this important for replenishing our energy and excitement for our science, it is also a valuable way to develop the Diverse Skills needed to make us successful in achieving our career goals. This point was highlighted in the Industry Career Panel held at the Danforth Center. If you weren’t there, be sure to check out the Storify on this event. 06/16/17 – Members of The Pub Club came together to develop, practice and “Polish” our “Elevator Pitch.” First, Bethany reviewed the skills we had worked on in the “Conference Prep Series” 1 and 2. In CPS 1 “Tweetiquette” we learned about networking and the importance of identifying your potential audience ahead of time, not when you bump into them in a conference elevator. We also learned that Twitter is the perfect tool to develop our skill at pulling out The Big Idea of our research, a conference talk or any other situation we find ourselves in. When you are limited to 140 characters, brevity is a requirement. In CPS 2, “Poster Perfection,” we learned about the importance of good imagery in capturing a person’s attention, and how to “Engage” that person with story telling once you have that attention. We then used these skills to improve our posters. Last week in the 3rd of our Conference Prep Series, “Polishing Our Elevator Pitch,” we learned that we all think when the time comes we’ll have it down. We also learned we are Wrong! After reviewing the skills developed in our previous Gatherings, the group went through the ingredients of a good elevator pitch. We then each took a turn applying each part to our EPitches. We found that step one, just introducing ourselves, proved to be a challenge. No one could resist the urge to quickly skip over their identity and describe their work. Bethany pointed out that even if your research EPitch was amazing, if you failed to adequately identify yourself, how would they follow up? Google “Lady in the elevator”? As much as we might enjoy our research, it is not who we are, and, if we fail to “Engage” our audience with who we are, then they will not be able to connect us with our work. In moving through building our EPitch skills we discussed how “Imagery” is not just visual, as we had used in our posters, but verbal as well. A successful Elevator Pitch will use verbal imagery to “Capture” a person’s attention and to “Engage” their interest. We went on to apply our Story Telling skills to transform what sounded like a list of bullet points (or “Ands”) into ABT’s. Once we understood the parts of our EPitch we broke up into groups of 2 to practice and “Polish” our individual EPitches. It was a productive hour at The Pub Club and fun was had by all, especially YanJuan and Bethany! 06/09/17 – Last Friday, The Pub Club used our Community of Minds to develop our communication and critical/creative thinking skills by critiquing our posters. Posters require all three forms of communication – verbal, written and graphical – and so are a great way to capture the essence of the Big Ideas and Key Findings of our research. However, we are all aware that posters can be boring and ineffective for various reasons. To help us prevent this with our posters, we began with Randy Olson’s TEDMED talk on employing the art of Storytelling to make our Communication more effective. Randy points out that our brains are wired to be receptive to information presented as a story. He also provides the simple “And, But, Therefore” (ABT) template for converting our information into a Story format. Randy explains that, as scientists, we tend to present our data as a series of “Ands.” By simply replacing some of those “Ands” with “But” and “Therefore,” we can introduce conflict and resolution into our presentation, which increases interest and retention by our audience. After watching and discussing Randy’s talk, we assessed our posters for three things: 1) Imagery, 2) Content, and 3) Story line. Does the overall appearance of your poster entice people to take a closer look? Does the Content highlight the Big Ideas, i.e. the Main Research Question and Key Findings of your work? Is the content presented as a story? How many “Ands” vs. “ABTs” do you find? Next week, we will apply this same concept into developing and practicing our Elevator Pitches. Hope to see you there! A special thanks to Pete, Adam & Ryan for help with setting up for last week’s Gathering. Thanks for being a supportive part of our COM! 06/02/17 – The Pub Club began as an effort to bring the “Conference Effect” home on a weekly basis. Rather than waiting for that one meeting a year to share and discuss ideas with other scientists, we take time to do this each week. However, while the local Community of Minds is a valuable resource, we also need to aerate the idea pool by interacting with other nodes of our greater COM. Conferences are an important part of this process! Of course, a key element of conferences is Communication. Think about it. What are the main activities of scientific meetings? Listening to others share their new findings or methods – Listening is a key component of good communication! Sharing our new findings either as a talk or poster presentation – both forms of presentation include elements of verbal, written and graphical communication. Networking to identify potential future collaborators or employers – to do this successfully, you must have a polished pitch and listening skills! This June, The Pub Club is putting our Community of Minds to the task of maximizing our conference experiences by developing Networking strategies and honing our Communication skills. We are also opening our Gatherings to all students and postdocs at MSU, especially those within the plant science community, who would like to participate. Last Friday, we focused on Developing a Conference Networking Strategy and Conference Tweeting: Why & How. As we had several first time TPC participants, Bethany started us off by providing a brief background on The Pub Club (TPC) and The Community of Minds (COM). We then got right to developing our Networking Strategies (click here to read more) by breaking into groups based on which conferences we would be attending and going through the list of conference-goers to identify people we would like to meet while at the conference. Bethany challenged us to think about Why we wanted to meet each person, as this will help us later in preparing to introduce ourselves. We next had a crash course in using Twitter as scientists, and some tips for Conference Tweeting etiquette (click here to read more). Of course, at The Pub Club, we like to immediately apply our skills rather than just talk about them! Each participant snapped a photo and sent a Tweet to @ThePubClub. Some even used the #MyOtherBench hashtag! We also got to see a Tweet shared by TPC PI, Brad Day, who is currently traveling with Miranda Haus to the Ukraine to interact and talk science with people there. We look forward to seeing more Tweets from our COM from #TPCOnTheRoad! By working and practicing together, we were able to begin developing our Conference Networking Strategies and learn how the whole Twitter thing works. This coming week, TPC participants will bring electronic versions of their posters to get input on content & design prior to the final polish and print stage of poster perfection. The following week, we will practice our Elevator Pitches by sharing the Big Idea of our research (using our posters as a backdrop) with each other. The Goal? MSU conference goers will be primed for the maximum conference experience. Watch out conferences – here we come! 05/26/17 – Last week at The Pub Club we had a smaller group than usual, likely due to the Holiday weekend. This gave us an opportunity to introduce a bit of the history of The Pub Club to two of our newer members, Yerlan (Day lab) and Reza (He lab). We discussed the original goal that led to the creation of The Pub Club, and the evolution of the group resulting in our current Mission. You can read more about this on The Pub Club “Mission” page, The “About The COM” page and our “FAQ” page. To hear personal reflections on The Pub Club, check out the “TPC Testimonials” page. We also discussed some of the skill development opportunities TPC offers, including the upcoming Conference Prep Series, which begins this coming Friday, June 2, 2017. See below for more details! 5/19/17 – Our first summer Gathering was spent on the cutting edge of science, as TPC members explored two recent Nature papers published by Xinnian Dong’s lab. Starting with the paper, “Global translational reprogramming is a fundamental layer of immune regulation in plants,” we assessed the data claim by claim. This article begins with a characterization of the Arabidopsis “translatome” after treatment with the Pattern Triggered Immunity elicitor, elf18, and compares it to the transcriptome. The main finding is that gene expression is not predictive of which transcripts are efficiently translated into proteins. They next search for potential mechanisms that regulate which gene transcripts are efficiently translated, and find a conserved, purine-rich motif in the 5′ leader sequence of these gene transcripts. This “R-motif” seems to act as a negative regulator of translation until the proper signal, in this case elf18, is perceived enabling translation. For some transcripts, such as TBF1, both the R-motif and upstream open reading frames (uORFs), act together to regulate translation. We found the data supporting these claims to be thorough and convincing. However, the next article is what really sells the story and shows the potential application of this work done in the model plant, Arabidopsis. In the accompanying article, “uORF-mediated translation allows engineered plant disease resistance without fitness costs,” the authors show that regulating a known defense gene/protein, SNC1, at the levels of both transcription and translation in Arabidopsis, they can confer protection against both bacterial and oomycete pathogens without a fitness cost. They then use the same approach, only this time with NPR1 expressed in rice, and show similar gains in protection, this time against three important rice pathogens, without a fitness cost. Thanks to all the TPC members who took time to meet with us “on the edge of science.” Not only did we learn about this exceptional, ground-breaking work in our field, we were also able to develop our critical thinking skills in the process! See you next time! We are officially in the summer season of The Pub Club, which means an even more relaxed approach to our weekly Gatherings. While we will not plan topics for every week, we most definitely will plan things at your request! A popular example from previous summers is sharing conference updates when we come back from meetings. This summer, we will also do more hands-on workshops, similar to the abstract workshop we had on May 12, 2017. Please feel free to share ideas as you have them! Also, we will be adding TPC member poster and/or oral presentations at ICAR (International Conference on Arabidopsis Research) to our Event Calendar to make it easier for us to support each other. If you are attending a different conference and would like to share your presentation information, simply log in and submit it as an Event. Introducing The Pub Club’s Summer Conference Preparation Series! Why do we go to conferences? To Learn of new breakthroughs and/or methods and Share our recent findings with others in our field? To Network? To Develop Skills by participating in workshops? To get re-motivated by Engaging with the greater science community? These are all good reasons to attend and participate in scientific meetings, but how often do we take time prior to conferences to develop a strategy to maximize our experience once there? Considering the amount of time and money we invest in attending, why not apply our research skills to Developing a Game Plan to maximize our experience once there? To help with this, The Pub Club is hosting a Summer Conference Prep Series. Discussion topics will include forming a networking strategy and the importance of preparing to make a great first impression. However, we will also dedicate time to polishing our verbal, written and graphical communication skills by practicing our Elevator Pitches and poster presentations as well as giving each other feedback on the content, design and flow of our posters prior to printing them. Interested? Then set those pipets down for an hour, step away from your computer and join others in your local Community of Minds (COM) to talk strategy, research our opportunities, form a game plan and work together to develop our skills. This year, we will be taking the conferences we are attending by storm! NOTE: you are very welcome to join us even if you are not attending a conference this year. You will just be that much more prepared when the opportunity comes!